A concurrence of genomic, reverse genetic and biochemical approaches has cracked the decade-long enigma concerning the identity of the transcription factors that control gene expression at the G2/M transition in the budding yeast cell cycle. The canonical cell cycle phases - G1, S, G2 and M - are defined in part by specific transcriptional programs [1,2]. In one sense, the phases of the cell cycle can be thought of as a circularly permuted series of developmental programs, perhaps best visualized by genome-wide transcriptional profiles, as cells progress synchronously through division (Figure 1a). As in developmental hierarchies, gene expression in one cell-cycle stage is often anticipated by the prior expression of the necessary transcription factors in the previous stage . For example, in the yeast cell cycle, the G1/S-specific transcription factor Swi4 is maximally expressed in M/G1 phase, and the M/G1 transcription factors Swi5 and Ace2 peak in G2/M phase (Figure 1b,c). In the latest revision of this complex wiring diagram, a long-standing puzzle as to the nature of the transcription factors that drive the G2/M program has been solved, in part through clues provided by genome-wide transcriptional analysis . Stage-specific transcriptional programs in the cell cycle are coupled to each other through an intricate interplay of transcription factors, cyclin-dependent kinase (CDK) activity and ubiquitin-dependent proteolysis (reviewed in ). In budding yeast, a single CDK, called Cdc28, is activated in G1 phase by three G1 cyclins (Cln1-Cln3), which initiate entry into the cell cycle, and again in later phases by different members of the family of six B-type cyclins (Clb1-Clb6), which drive DNA replication, spindle elongation and mitosis. Precisely timed proteolytic degradation of cyclins and other cell-cycle regulators by the ubiquitin system turns on CDK activity in late G1 phase, and turns it off at the end of mitosis. As part of this regulatory circuit, the cyclins themselves form crucial elements of the G1/S and G2/M transcriptional programs, often referred to as the CLN2 and CLB2 clusters, respectively. The transcriptional landscape of the cell cycle is dominated by these two large suites of gene expression, which are driven by different cyclin-Cdc28 activities . Induction of the 120 or so genes in the CLN2 cluster is dictated primarily by Cln3-Cdc28 activity, which stimulates the G1/S transcription factors Swi4, Swi6 and Mbp1. In a similar manner, Clb1/2-Cdc28 activity drives the expression of roughly 33 genes in the CLB2 cluster, including CLB1 and CLB2 themselves and genes encoding other important mitotic regulators, such as CDC20, SWI5 and ACE2. In the absence of Clb1/2, cells arrest at the G2/M boundary and fail to execute the G2/M transcriptional program . This positive feedback loop of Clb1/2-Cdc28 activity and CLB1/2 transcription is presumed to help effect a switch-like decision to enter mitosis. Degradation of the Clb cyclins at the end of mitosis collapses the positive feedback loop and thereby allows re-entry into G1 phase . 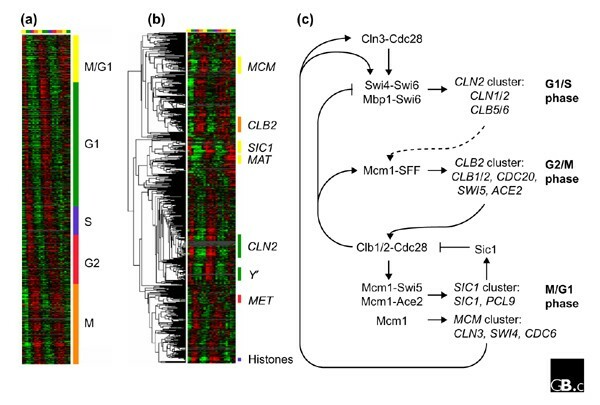 Whereas the G1/S transcription factors succumbed to genetic analysis long ago, the factors that drive the CLB2 cluster have proven elusive, despite their biochemical characterization some ten years ago . DNA footprinting analysis of the SWI5 promoter indicates that its periodic expression relies on binding of the ubiquitous MADS-box transcription factor, Mcm1, in combination with an activity called 'Swi five factor', or SFF [6,7,8]. Nearly all the promoters in the CLB2 cluster contain a binding site for Mcm1-SFF, referred to as the Swi5-factor responsive element, or SFRE . Combined genomic and biochemical assaults have now at last revealed SFF to be a complex of the forkhead-like transcription factors Fkh1 and Fkh2, and another transcriptional activator, Ndd1 [3,9,10,11,12]. One of the first clues to the identity of SFF came from careful analysis of cell-cycle-regulated genes that reach an apex of expression in S phase, just before the CLB2 cluster is activated . FKH1 was one such gene. Starting from the notion that the transcriptional activators of one cluster are often expressed in the previous wave of transcription, Futcher and co-workers  surmised that Fkh1 might be a candidate for SFF. Perhaps not entirely coincidentally, forkhead-like transcription factors often control elaborate developmental programs in metazoans . The fact that the yeast genome encodes a closely related homolog, Fkh2, added an alluring twist, in that redundancy may have precluded identification of SFF by genetic approaches. Analysis of the FKH1 and FKH2 genes soon substantiated the genomics-driven hypothesis. Not only is Fkh1/2 required for cell-cycle-regulated expression of the CLB2 cluster, but the two factors bind a sequence element that matches the SFRE . Consistently, genetic analysis of FKH1/2 function revealed a role in the G2/M transition [3,9,10,11,12]. In an independent biochemical approach, Fkh2 was also identified directly through purification of proteins that bind the SFRE sequence . The evidence that Fkh1/2 forms part of SFF is compelling. Cell extracts from fkh1 fkh2 strains are unable to cause a gel-mobility shift of a SWI5 promoter fragment, whereas antibodies directed against Fkh2 supershift the SFF-DNA complex from wild-type cell extracts [10,11,12]. Most importantly, chromatin immunoprecipitation (ChIP) experiments, in which protein-DNA interactions are stabilized and then detected by PCR amplification, show that Fkh1 and Fkh2 both bind to the CLB2 and SWI5 promoter regions in vivo, but not to mutant promoters that lack SFRE sites [3,10,12]. Given the central role of Fkh1/2 in mitotic cyclin expression, it is not surprising that fkh1 fkh2 double mutant strains exhibit a severe G2/M delay and a pseudohyphal growth phenotype [3,9,11,12], both of which arise from defects in mitotic Cdc28 kinase activity . Of the two genes, FKH2 appears to account for most of SFF activity, by both biochemical and genetic criteria. Lastly, as might be predicted, the absence of SFF activity from fkh1 fkh2 strains causes a domino effect in which the downstream SIC1 gene cluster fails to oscillate properly because the Swi5 and Ace2 normally provided by the CLB2 cluster are poorly expressed . There is more to SFF than just Fkh1 and Fkh2, however. Although the CLB2 cluster loses its normal periodicity in fkh1 fkh2 mutant cells, the cluster is still expressed at a low constitutive level [3,9,10,11,12]. By inference, like other transcription factors such as E2F-1, Fkh1/2 may have both activator and repressor functions. Consistent with this possibility, and in spite of the modest peak in transcription of FKH1, it appears that Fkh1/2 and Mcm1 remain bound at the CLB2 and SWI5 promoters throughout the cell cycle [7,10]. Other, as yet unidentified, proteins that co-purify with Fkh2 may account for repression outside the G2/M window . What, if not Fkh1/2 binding, accounts for the cell-cycle-regulated transcription of the CLB2 cluster? The periodic activity of SFF appears to be due to Ndd1, a recently identified transcription factor necessary for the expression of CLB1/2 . NDD1 was recovered as a high copy-number suppressor of the cdc28-1N allele, which is specifically defective in mitotic Cdc28 activity . In fact, several of the CLB genes were themselves first discovered as dosage suppressors of the cdc28-1N defect . In contrast to Fkh1/2, Ndd1 is essential for the G2/M transition, is a rate-limiting activator of CLB1/2 and SWI5 gene expression, and has transactivation function when fused to a heterologous DNA-binding domain . In sensitive ChIP experiments, Ndd1 does indeed associate with the CLB2 and SWI5 promoters in vivo, in an Mcm1-Fkh1/2-dependent manner . NDD1 expression peaks just before that of the CLB2 cluster, and perhaps even more intriguingly, Ndd1 protein stability is also regulated during the cell cycle, being unstable from late anaphase until the end of G1 phase, like the Clb proteins . Finally, the inference that Fkh1/2 also effects transcriptional repression is buttressed by the elegant genetic result that loss of Fkh function bypasses the requirement for Ndd1 . These recent discoveries lead ineluctably to the model in Figure 2. Prior to the expression of Ndd1, the Mcm1-Fkh1/2 complex is bound to SFRE sites in the promoters of genes in the CLB2 cluster, where it appears to mediate transcriptional repression. As cells complete S phase, Ndd1 is recruited to the Mcm1-Fkh1/2 platform, thereby displacing the presumptive repression machinery, and at the same time recruiting the RNA polymerase II holoenzyme to activate transcription. This model begs an important question - how is the Ndd1 interaction with Mcm1- Fkh1/2 controlled by Clb1/2-Cdc28 activity? An exciting possibility is suggested by the structure of Fkh1 and Fkh2. In addition to their DNA-binding domains, Fkh1 and Fkh2 contain a forkhead-associated (FHA) domain, recently shown to bind phosphoserine peptide motifs . One cannot help but imagine that Clb1/2-Cdc28 kinases will phosphorylate Ndd1, which contains numerous Cdc28 consensus sites, and thereby drive its binding to the FHA domains of Fkh1/2. Alternatively, as Fkh2 is itself phosphorylated just before mitosis , it is possible that intramolecular interactions between the phosphorylated residues and the FHA domain might regulate the association of Fkh1/2 with Ndd1. Mutation of the FHA domains in Fkh1/2 and the relevant phosphorylation sites in Fkh1/2 and Ndd1 will be the acid test of the Ndd1 recruitment model. 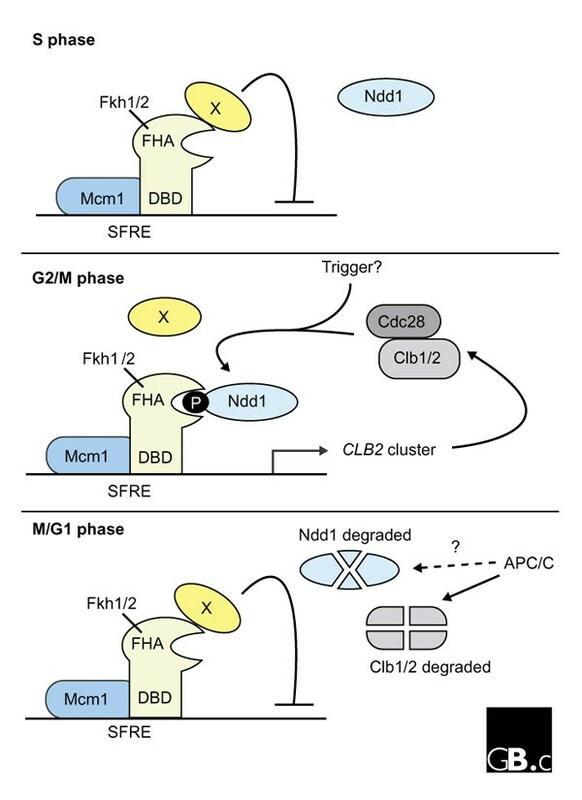 The identity of the presumed repression machinery that associates with Fkh1/2, and how it is displaced by Ndd1, will prove crucial for understanding the switch from transcriptional repression to activation at the G2/M boundary. As noted, other proteins that bind the SFRE may provide clues in this regard . As with all positive feedback loops, however, the tricky part is to understand just how the feed-forward process gets started in the first place. The trigger for SFF-dependent transcription remains a mystery, but application of the logic that led to the discovery of Fkh1 and Fkh2 suggests that factors that regulate the expression of FKH1/2 and NDD1 may help to determine the onset of transcription of the downstream CLB2 cluster. Indeed, FKH1/2 and NDD1 are candidate members of the cell-cycle-regulated "cluster 14" of S phase . In silico promoter bashing of this cluster may identify candidate promoter elements, which in turn could allow identification of the cognate transcription factors. At the end of mitosis the demise of the CLB2 cluster contributes to the catastrophic collapse of Clb-Cdc28 kinase activity necessary for mitotic exit and re-entry into G1 phase. Ndd1 degradation seems likely to accelerate this process, as destruction of Ndd1 coincides with activation of the anaphase-promoting complex/cyclosome (APC/C), the ubiquitin ligase that marks numerous mitotic regulators for proteolysis by the 26S proteasome . Whether the APC/C or some other pathway eliminates Ndd1, the consequences of mutational stabilization of Ndd1 certainly merit investigation. Finally, the enigmatic connection between low Clb1/2-Cdc28 activity and the pseudohyphal growth response may become more transparent upon further pursuit of SFF regulation. In any case, the identification of Fkh1, Fkh2 and Ndd1 as key components of SFF fills a conspicuous gap in the wiring diagram of the budding yeast cell cycle (Figure 1c), and provides one of the best examples to date of genomics-based, 'analysis-limited' research . The transcriptional wiring diagram of the budding yeast cell cycle. (a) Waves of transcriptional activation (red) and repression (green) across two synchronous division cycles, as determined by DNA microarray analysis. Colored bars indicate cell cycle phases. (b) Cell-cycle-regulated gene clusters. (c) The main transcriptional circuits. The dashed line represents undetermined intermediaries between the CLN2 cluster and the CLB2 cluster. Panels (a) and (b) are modified and reproduced with permission from the experiment depicted in Figure 1 of Spellman et al. .
Regulation of the CLB2 cluster by SFF. Abbreviations: APC/C, anaphase-promoting complex/cyclosome; DBD, DNA-binding domain; FHA, forkhead-associated domain; P, phosphorylation; X, presumptive repression machinery. See text for further details. P.J. is supported by a National Sciences and Engineering Research Council predoctoral award. M.T. is supported by the National Cancer Institute of Canada, the Canadian Institutes of Health Research and the Protein Engineering Network Centres of Excellence.